Tonight it struck me that outside my cottage window there was a quiet miracle happening. 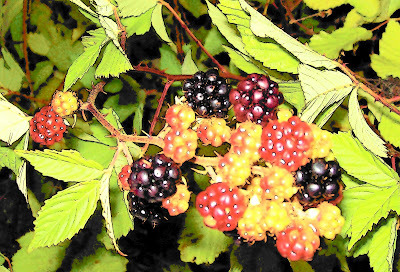 The blackberries are coming ripe. The sun was low in the sky, and had lost most of its heat, the light was golden-----I needed to walk away from my to-do list and my favorite distractions and simply roam along the long living wall of berries that borders my property. I took a small bowl with me----nothing big enough to seem like work. As I picked, thoughts came to mind that seemed large and relaxed and comforting. I had done nothing to make these berries grow. No planting. No watering. No worrying about what kind of crop they would produce. Yet here they were, more berries than I could ever harvest. Doesn't it make you think about God's way of looking at things? It did me. He seems untroubled by what we might consider waste, somehow. What is His secret? In my humanity, I am always and forever looking for ways to make the most of my resources, maximize my potential, etc. etc.----a trait much admired in our country. But on a good day, I wonder about that. I wonder about it very much, and I take it with a grain of salt. This is helpful as I walk through this newest chapter of God's Stroke of Genius with Stu. So much of his story seems like a waste on first examination. If he was going to end up in a nursing home for the last part of his story, what was the point? It looks, to my human eye, like all thorns and brambles. Stu himself can not understand what has befallen him, and goes up and down the gamut of emotions, trying to find a balance point. I do what I can to reassure him, but really, who am I? Just another traveler. The thorns grab at me, too. Some days I feel pretty scratched up! But down deep, where thorns can't reach, I am at peace. And I believe that the same is true for Stu, even if it's sometimes hard to tell. The One who planted knows the outcome. He knows the pattern of growth, and what is needed to produce a crop. I find myself grateful that even during the waiting, there are days like this, where a hedge of blackberries can remind me of His nature. How good He is! Oh, yes, Moriah----we are always elbow to elbow along the berry hedge, spiritually :-) How comforting is that? I am so excited for the next few weeks----I know I will feel even closer to you as this new baby makes an appearance!